Adds color and/or monochrome grain to the source clip. Amplitude and frequency parameters allow adjusting the grain texture independently for all colors together, each color channel, or black and white grain. Source: The current track. The clip to combine the grain with. Background: Optional. Composites the Source and grain over this clip. Mask: Optional. Scales the amplitude of the applied effect. For black areas of Mask, the Source remains unchanged, for gray areas the effect is reduced. Only the red channel of this input is used. The mask can optionally be inverted using Invert Mask parameter. Scales the color of the grain by this value. The grain will include both positive and negative values of this color. Color Amplitude: Default: 0.1, Range: 0 or greater. The amplitude of color grain to include. Color Frequency: Default: 100, Range: 0.01 or greater. The frequency of the color grain. 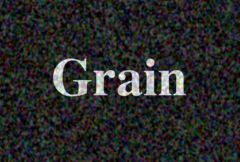 Increase for finer color grain, decrease for coarser color grain. Red Freq: Default: 1, Range: 0 or greater. The relative frequency of the red channel grain. Green Freq: Default: 1, Range: 0 or greater. The relative frequency of the green channel grain. Blue Freq: Default: 1, Range: 0 or greater. The relative frequency of the blue channel grain. Color Octaves: Integer, Default: 1, Range: 1 to 10. The number of octaves of color grain to include. Each octave is twice the frequency and half the amplitude of the previous. Bw Amplitude: Default: 0.05, Range: 0 or greater. The amplitude of black and white grain to include. Bw Frequency: Default: 100, Range: 0.01 or greater. The frequency of the black and white grain. Increase for finer grain, decrease for coarser grain. Bw Octaves: Integer, Default: 1, Range: 1 to 10. The number of octaves of black and white grain to include. Each octave is twice the frequency and half the amplitude of the previous.